A smattering of independent bottlings and a wide range of age statements this week, including two Lowland single malts of great maturity. This is barely coloured, which indicates a refill cask. Not surprisingly, therefore, it’s pretty hot – even at 46% – as the wood hasn’t managed to calm the spirit down. There is, however, a light oily sweetness, like eating a fondant fancy while wearing an oilskin, and a subtle drift of smoke. As it opens there’s draff, but when diluted it becomes more like new make. The smoke is certainly there but not, as you might expect, in an overly punchy way. The effect, though, is of two distinct movements: sweetness to start with, and then an abrupt change into heat. When diluted, these two disparate elements come together and push the smoke into the background, where it lurks like a schoolboy hiding round the back of the bike sheds. The palate shows three distinct elements which, with longer in cask, would have come together. Waking very early on a winter’s morning when berthed in Tobermory harbour. As the nose is a little numb and slightly sulky to start with, it makes sense to add a little water quite quickly. The dilution shakes things up and the effect is distinctly better, bringing with it with more biscuity notes – think Rich Tea biscuits dipped in sweet, milky tea. There’s a little apple as well. More mealy – think of sweetened porridge if you can countenance such a thing. There’s also heat, suggesting a lack of cask interaction. The smoke is low, but there is a little mid-palate sweetness. A quick mid-morning snack when rushing to another meeting. Slightly thicker than most Auchies, but high-toned as well, a quality which is sometimes obscured by oak. There’s a hint of sweet digestive biscuits and a whiff of flowers, then the sensation of wet, peeled bark. In time, there’s some dusty earth before vanilla sidles its way into the mix. A teasing mix of sweet and dry with marzipan, cinnamon toast, and with water those green notes – now akin to freshly cut grass. It’s also now considerably spicier: dry coriander seed and a little nutmeg. Very Hart Brothers in its poise and elegance. A good Auchie. Casually whittling a stick while wandering aimlessly along the upper reaches of the Clyde. Excellent distillery character (bran flakes and hot milk), which also stirs in off-dry Amontillado Sherry notes, a little raisin, and moist fruit cake. This very ‘Rothes interplay between the sweet and the dry continues as it opens. The spirit is big, showing almost decadent spiciness (again typical of the distillery), but moving and developing very slowly on the tongue. Hints of nut, light dried and sweet fruits. It does need water, but have it on the side; adding it directly means the subtle layering of flavours is lost. Balanced, with the cask in check. Nicely mature. Rich and generous – as you’d expect from a first-fill Sherry cask. Gingerbread, lush baked fruits and the polished wood and beeswax aromas which come from long-term maturation, alongside a light touch of clove and plump currant. Very thick and chewy, with the oiliness of the distillery to the fore. This, though, adds texture and softens the tannins from the cask. A pleasing mix of dried apricot, sultana and Sherry in the centre. I’ve had a vexed relationship with Littlemill. There was one bottling which was so terrible (‘a baby being sick in a chlorinated swimming pool’ was how I described it) that I’ve been slightly leery of it ever since. I know. Shame on me. This shows how that bottling was the exception and that, at its best and in a great cask, this is a fantastic dram. A resonant cello solo in a candlelit grand house. Very pale and pretty. Think of an old-fashioned sweet shop and you will be heading in the right direction. Light, powdery, with some pear juice and a green acidic edge. In Martine Nouet’s terminology, a 'whispering whisky'. Water doesn’t help in any way. As the nose suggests. Lacy in structure, the freesias come in along with gooseberry jelly, mint and elderflower pressé. I’d like to see a cocktail made from this. Becomes ever more perfumed with a little hint of lavender. Add water and everything shatters. Approachable and delicate and a typical Speyburn, which for some reason is an oft-derided distillery – I suspect more because of its low price rather than the innate quality of the spirit. A chiffon scarf blowing in the wind. Batch 5 11/09/2015 Plenty of single grain this week, alongside two blends – including a rye-accented Johnnie Walker. 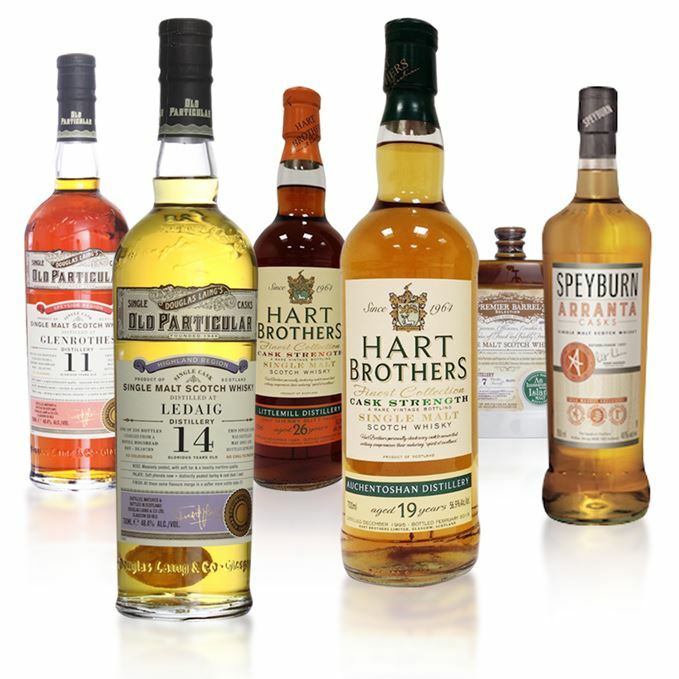 Batch 3 28/08/2015 A Highland-accented collection, including a quartet of Balblair vintages and an NAS Dalwhinnie.